As a voice over artist I do a lot of work as a sports commentator voice. I’ve always loved football and always look forward to a World Cup. Occasionally, I also get to meet my childhood heroes from the other side of the mic. 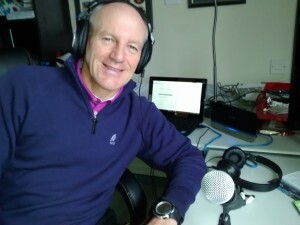 I did a spot of work for BBC 5Live a while back and was asked to help out with an interview with former Man Utd and England legend Steve Coppell. As a Panini sticker collecting would-be football commentator ten year old growing up in the Midlands in the 1970s if you’d told me that one day I’d be going to the United no. 7’s house I’d have probably swerved my Raleigh Chopper into an oncoming Spangles lorry. Slightly embarrassingly for me, the great Steve Coppell hadn’t. It was around a year earlier. I got called to a very swanky London hotel for another recording job, this time to meet Edson Arantes do Nascimento…Pele. What a wonderful man, and almost presidential in the way he carried himself; a man with absolutely nothing to prove to the world. Well, having won three World Cups for Brazil and considered to be the greatest of all time, why would he? At no point did he offer to make me a cup of tea though. 1-0 to Coppell; let alone a refill. 2-0. Nor did he hang around to chat footy afterwards or suggest that maybe we should have a kickabout, “I’ll go in goals if you like.” 3-0. 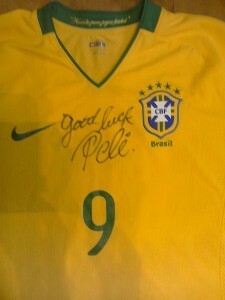 What he did do though afterwards was to sign the Brazil top that I just happened to have on me and leave me feeling just like that excited Panini sticker collecting ten year old all the way home on the tube. Let’s call that 3-3 and a magnificent comeback from the world’s greatest! I’ve been the voice of many national and global productions as a football and sports commentator voice. To hear my football commentator voiceovers click here or if you’d like to book me for your World Cup 2018 project click here. This entry was tagged football, Football commentator, Football voice over, jonathan clays, pele, sports commentator voice over, steve coppell, voice over, voiceover, world cup, world cup 2018, world cup 2018 voice over, world cup commentator. Bookmark the permalink.